Chuck Schumer files a federal marijuana decriminalization bill, a Delaware legalization bill wins a majority but not the needed supermajority, Health Canada releases legal marijuana regulations, and more. Senate Democratic Leader Introduces Bill to Decriminalize Marijuana at the Federal Level. Sen. Chuck Schumer (D-NY) on Wednesday introduced legislation that would decriminalize and de-schedule marijuana at the federal level by removing it from the Controlled Substances Act. The bill would also take some initial steps toward reducing the decades-long damage of marijuana criminalization. One provision would provide $20 million annually for state and local programs to expunge or seal the criminal records of people convicted of marijuana possession. It also creates a small business trust fund at the federal level (based on a fraction of the money generated by the marijuana industry) to give loans to small businesses owned by women and socially and economically disadvantaged individuals. Arizona Poll Has Narrow Majority for Legalization. A new Emerson College poll of Arizona voters has support for marijuana legalization at 53%, with 39% opposed. The poll noted that the group most split on the issue was Hispanic voters, with 45% in support and 44% opposed. Majority of Delaware Lawmakers Approve Marijuana Legalization Bill, But It Fails. A bill that would legalize marijuana, House Bill 110, won a majority of votes in the House on Wednesday, but failed to advance because it needed the votes of at least 60% of representatives, and fell four votes short. The bill needed a supermajority because it contained provisions dealing with taxes and fees. Las Vegas Will Try Again to Legalize Marijuana Lounges. The city of Las Vegas is again looking at ways of allowing social use venues for marijuana. The city held a public workshop Wednesday to discuss a draft ordinance to allow for such public use. Officials said the earliest the city council might vote on the issue is about three months from now. Health Canada Rolls Out Legal Marijuana Regulations. Health Canada has released some 400 pages of regulations for the country's about-to-emerge legal marijuana industry. Among the highlights, criminal records won't necessarily bar employment in the industry; there will be subclasses of licenses for micro, standard, and nursery cultivation; pre-rolled joints will be limited to one gram of weed; and strict branding and packaging regulations. 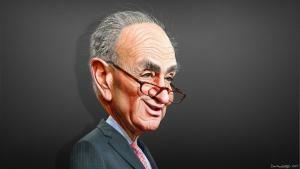 Ironic about Schumer since he was the first elected official to raise a stink about the Silkroad and get the attention of the DEA, culminating in the infliltration and toppling of that site. Silkroad provided the best harm reduction available for users of all drugs. P.S. The captcha on this site is primitive and cruel.